I don’t know when my love for the current Fiat 500 will end. Yes, I know you sit on it rather than in it, it’s relatively cramped inside and it sometimes hops around like a pogo stick – but I really don’t care because it’s one of those cars I can’t stop smiling over when I drive it. But it’s relatively sanitized when compared to some of Fiat’s old super-small cars, which leads me to believe I might have more fun in something more rear-engined. And smaller. With that, I present for consideration two Fiats from history and evaluate which one might satisfy a Jalop’s tiny car fix. This wouldn’t be a contest between small Fiats without an old 500. Actually, an old Nuova 500. This is a 1973 Fiat 500L that was meant to be the modern version of a car that wasn’t entirely modern even for 1957. There’s the 499cc engine that makes 17 horsepower, or about as much power as you make waving your arms around like an Italian. And what’s with the checkered fold-down roof here? This isn’t a Mini. But how could I be so harsh towards a Cinquecento? It’s freakin’ adorable. I love the blue/red color scheme on this one, too, and that interior looks like it’s in tip-top shape. The seller also said the electrical works, which is nice. These are the 500s you can’t help but want to pick up and hug. 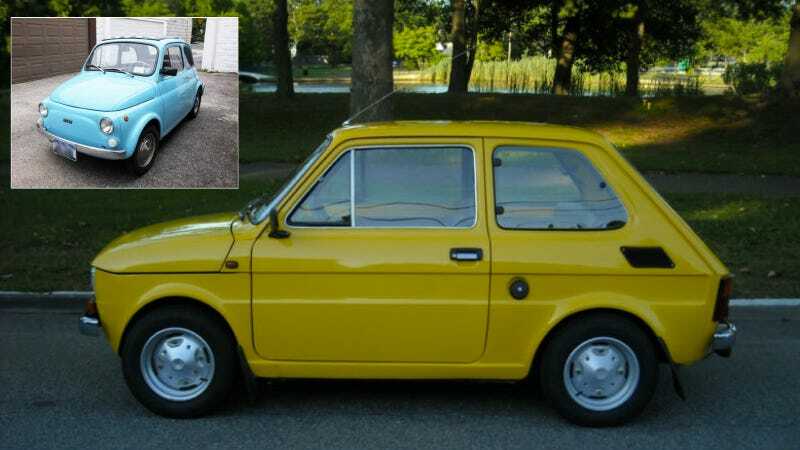 Before you get too googly eyed over the 500, let's think about a small Fiat you really don’t ever see in the States. It’s a 1976 Polski-Fiat 126p and it’s actually more Polish than it is Italian. Made from Italian parts in Tychy, Poland (where, coincidently, the current Fiat 500 is now made), it actually sticks close to the 500’s philosophy of a tiny car with rear wheel drive and a rear-mounted engine. It sports a 600cc engine with 24 horsepower that creates the same power as a light windstorm. At least in a 126, the gearbox is synchronized. This particular one has been done up nicely from its bare-bones Polish-Italian origins and sports a Momo steering wheel, a radio of some kind, upgraded suspension and a clutch that sounds like it can withstand speed. The seller also claims it’s the only 126p in the US (it isn't, apparently), which contributes to the reason the asking price is $16,800. You could have a Smart convertible for almost as much! I love the older 500s and if I were comparing an Abarth one, I might have to go for it. But there’s something so odd, so ‘70s Italian car about the 126p that I can’t stop being taken in by this very clean and restored example. Having seen a few of these up close, they are very nearly as miniscule and laugh-inducing as a Cinquecento without being quite so ubiquitous. I’d consider paying a lot for that. Now, if I found a Giardiniera, things would be different. What about you? Is the 500 the only small Fiat you love or would you veer towards the Polski and dare to be different? Sound off.